(2.6m shares buyback April ) Philip Let me put it into perspective. 1. Their power plant business is VERY badly managed and their concessions end in 2019. There goes 11 million in revenue and negative profits. Which is subject to renegotiation at tough rates. Sesb didn't like inconsistent power anymore than you or I do. 2. Their Eden restaurants are also VERY badly managed with outlets closing left right and centre. 3. Their manufacturing business of LV switchgears are in a really bad market right now, especially when there are specialists like kinta and central switchgear which sells lower prices and have bigger profits ( efficiently run). 4. Eden has not made a profit since 2012. Every year losing money, since it hasn't diluted it's shares the money has to found from assets. 5. The assets in question have dropped from 295 million 2012 to 247 million in 2019. It will continue to drop in the foreseeable future, bar a share dilution to stem the tide. 6. They do not have the capability, financial resources or management acumen to properly manage those land sales in kuantan at good rates. Even if they did, do you know exactly where the ecrl route will be and where the Eden lands will be in relation? This is speculation, gambling, NOT investment. targetinvest yea i agree all is bad until worm also rotting inside. that is why the land need to be sold off faster than ever..
5c0160 targetinvest are u the gun man hire by eden boss to promote eden? every year losing money can consider rubbish share later go pn17 soon. John Lu If only eden know how to unlock the value of their land.. Most of the time for these asset play stock.. Need to wait for yearsss..and if 450 acre of land so huge land if value at 22/ft will be not so accurate.. They bigger a land is, it will be cheaper compare to a smaller size of land in the same location. Knowing that I am not investing but speculating has protected my capital for many years. You must truly know the difference. Look up Benjamin Graham for his definition of investing and speculating. Keep you investing simple and safe. targetinvest I understand all of your concern. The risk is legit, the company is risky, it is losing money.. But the asset is also real.. At desperate situation, there will be value. Just look at Seacera.. Why Tiger Tan want to take so much stake until become a substantial stake holder in Seacera? His reason is simple - because of the 500 acre of land behind Sg long and as a developer, he knew that is something that is of value. When seacera drop to the brim of going below 20 cents, he came up and wipe the share from the force selling..
At every fall, opportunity appear. targetinvest The only thing now is EDEN need to factor in the total warrant and also the total convertible notes from the white knight.. This will result in dilution. But the land investment definitely is a legit asset and it will be instrumental for EDEN to rebound again..
targetinvest As you see.. The media is in control..
Now there is literally no media covering on the news of EDEN golden asset land. Not to say The star and the rest, nan yang sinchew china press..
All keeping quiet... Is the editor and the team swopping up the shares until the right time come? 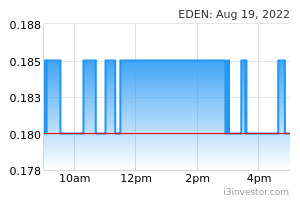 Of course, when things are being covered, EDEN is definitely not at 17 cents anymore. (2.6m shares buyback April ) Philip You are too emotional. You should stick to investing in reliable companies and good healthy management. I think even if you borrow all your family money will not be enough to buy 1% of johotin? It is your best investment ( next to hssbe. Why don't you stop throwing money into bad investments and concentrate all your money into a good investment like johotin? You would make much more money in the long term instead of making money here but losing it all in the next badly researched stock? Cut your losers and follow your winners. 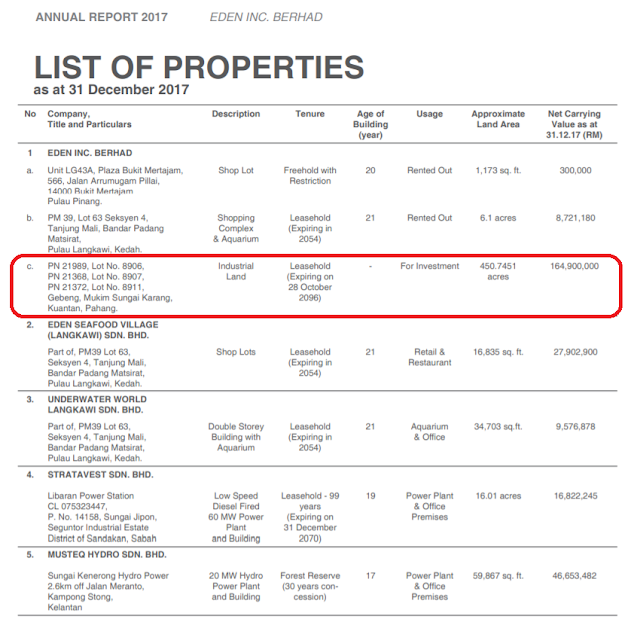 KingBursa2019 eden mau 1 ringgit ka ?? ramada What should I do? You buy all, I stay aside. Heavenly PUNTER Yeah so good sailang sell house sell car margin maximum go buy lah! indiawait you wait, wait, wait and wait. 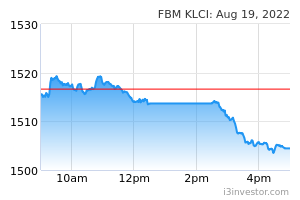 Karlos Convertible loan stocks being converted at only 12 sen! More conversions at that price probably will happen, so be xtra careful in buying.